Home Food	Smarty Cooking School: Copycat Pork Fried Rice – Skip the Takeout! My kids love Chinese food but, to be honest, ordering takeout for seven people can get really, really expensive. Save yourself some benjamins and make this super easy copycat pork fried rice. This copycat pork fried rice is just like Chinese takeout. Except better. 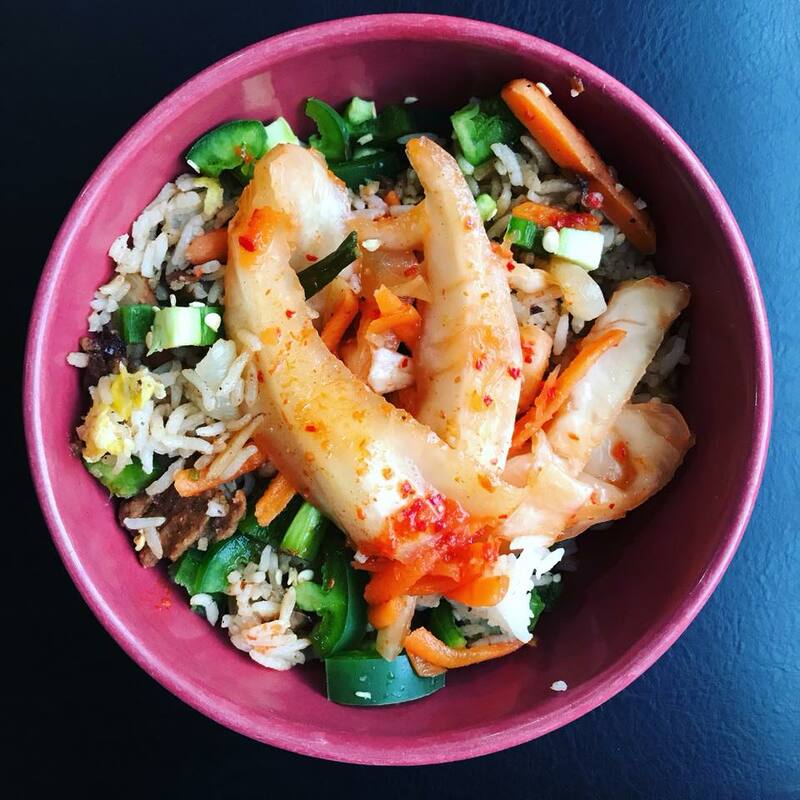 I was able to save one small bowl of leftovers and ate that for lunch the next day topped with sliced jalapenos and spicy kimchi. Yum. If you can squirrel away any leftovers, this rice might be even better on the second day! We are huge fans of fried rice and stir fries over here. They are just SO EASY. Fried rice and stir fries are also a great opportunity to use all the leftover veggies sitting in your fridge. 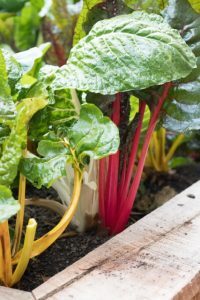 And, if you have a winter garden right now, a stir fry or fried rice is perfect for your winter vegetables like Swiss chard, broccoli, or spinach. There is nothing better than to be able to make a delicious meal out of vegetables and ingredients you have on hand. We really enjoy making Asian meals so I try to keep some ingredients on hand like fish sauce, soy sauce (or gluten-free tamari), hoisin sauce, and ground or fresh ginger that are often used to season stir fries and fried rice. A stir fry or a fried rice is a perfect was to showcase seasonal vegetables and you can perfectly tailor your meal to the tastes of your family. 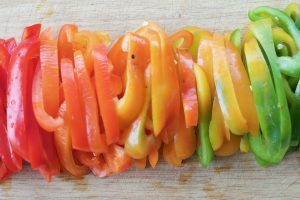 For example, my children want to kill me when I add in sliced peppers to any stir fry or fried rice but they are more than happy to eat those peppers raw. Kale, swiss chard, broccoli, onion, garlic, carrots – even sad looking baby carrots – are all prime fried rice veggie contenders. If your kids love Chinese takeout, I guarantee that they will love this copycat pork fried rice. Prepare the pork first. When I need to cut meat, I like to let it sit in the freezer for a little while so it’s easier to slice into nice, uniform pieces. Cut your 1 pound of pork tenderloin into thin strips about ½ inch wide and 6 inches long. Don’t trim the fat. Fat is flavor, it will all roast up beautifully. Toss the pork in the marinade and make sure all the pieces are coated. Ideally, let the pork marinate for two hours. Less Is fine. To cook the pork, place a cookie rack on top of a sheet pan. Spray the cookie rack with nonstick spray. Gently lay the strips of pork on the cookie rack. Cook at 350 for about 20 minutes. Taking the rest of the marinade, add 2 tablespoons of honey and heat the marinade over medium heat. Stir well. After the pork has cooked for 20 minutes, flip the pieces and coat with the reserved marinade and honey mixture. Cook for another 10-15 minutes. Remove from the oven and cut into pork fried rice sized pieces. For the rice – I made 2 cups of rice in my rice cooker earlier in the day and let it cool. Cooled rice is better. In a frying pan, heat the toasted sesame oil and beat three eggs in a separate bowl. Add the eggs to the hot toasted sesame oil and scramble. Remove from the pan. In the same frying pan, add a little more olive oil and your thinly sliced veggies – broccoli, carrots, onion, garlic, etc. Add a little salt. Saute until soft. Add the rice into the pan. Stir. Put it all together – Whisk together 2 Tablespoons soy sauce and 2 tablespoons fish sauce and add ½ teaspoon of sugar.